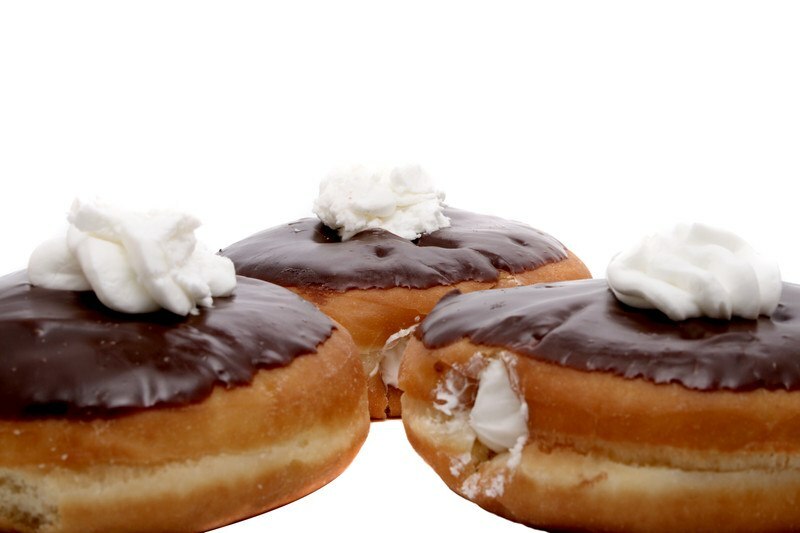 My homemade donut recipes include all my favorites: the cream filled kind. Maple Long Johns (Maple Bars), Bavarian Cream Filled Donuts, Cream Filled Bismarks and Chocolate Eclairs too. Making pastry is easy with the method I show you and eating them? That's the easiest part of all. 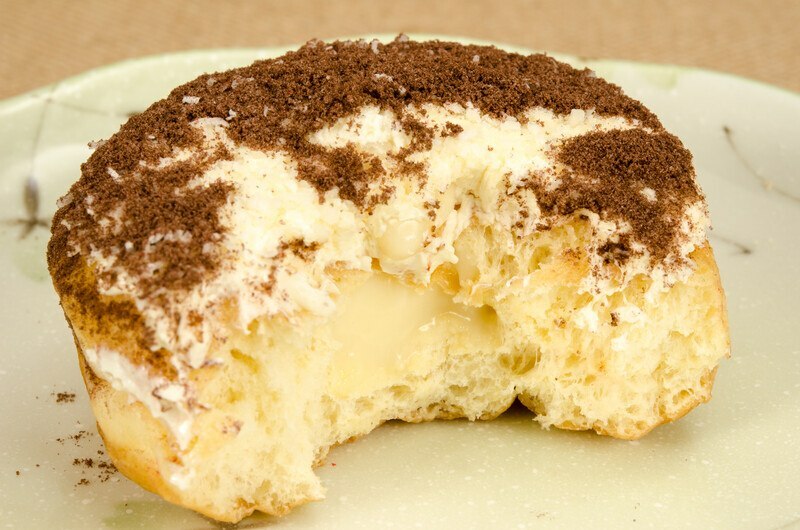 Bavarian Cream Donuts are one of my favorites. Following is a simple recipe you will use often when the craving hits and you don't have hours to make them from scratch. The recipes in brown are all easy recipes that can be used interchangeably with other recipes and fillings for donuts. They are just so darn easy, I thought you would appreciate them all together as I have put them below. In a large Dutch oven, cast iron pan, deep fryer or heavy skillet, heat 1/2 to 3/4 inches of vegetable oil until it reaches approximately 350 degrees or when you flick water in it the oil will sizzle. Separate biscuits and fry each one for 2 to 3 minutes on each side. Place on paper towels until cool. Add pudding mix with the milk in a mixing bowl and beat for two minutes; set aside. In another bowl, whip the heavy cream with the confectioners sugar for three minutes until soft peaks form. Fold in the vanilla pudding. Cover and chill in the refrigerator until needed. Chop the baking chocolate into pieces and place in a small mixing bowl. Heat the heavy cream to a simmer only - do not boil and add to the chopped chocolate. Whisk until chocolate is melted and icing is smooth. It's ready to use. Spoon the chilled pudding mixture into a large pastry bag with a tip. Press the tip into the side of the donut and squeeze gently until donut appears to be rounded and full. Repeat for the rest of the donuts. If there is any left over, it is all yours; enjoy it. Dip the top of the filled donut in the warm chocolate icing. Place on a cooling rack for a couple minutes and it's ready to devour. Place the warm (105 to 115 degrees) water in a bowl and sprinkle with yeast over the top. When bubbled the yeast has proofed; add mixture to a mixing bowl. Then add the lukewarm milk, granulated sugar, salt, beaten egg, vegetable shortening and 1 cup of the flour. Beat on medium speed, scraping down the sides, for two minutes. Add the remaining 1-1/2 cups flour and work by hand until dough is smooth. The dough will be soft and a little sticky. Oil a stainless steel bowl and put the dough in it (no plastic). With the remaining oil you have on your hands from oiling the bowl, lightly rub on dough and cover with a damp towel. I use flour sack towels because they are light and don't rest right on the dough when rising. Just mist with water and cover bowl. They are great for drying dishes too. Place in a warm place; I turn the oven on 350 for 15-30 seconds (count to 15) and turn off, then put my dough in there to rise. Let rise until doubled in size; approximately 60 minutes. Turn out the dough onto a floured surface and pat it flat. Roll out with a rolling pin until 1/2 inch thick. Cut dough with a round cookie cutter or a tumbler drinking glass. Flour baking sheets (make sure it is lightly coated with flour) and place donut cut outs evenly spaced on baking sheet. Let rise in a warm area until doubled in size; about 40 minutes (see note in above paragraph on using the oven). After the donuts have risen, heat oil to 350 degrees in a dutch oven or cast iron pan. Gently drop 3-4 donuts into oil and fry until golden brown; approximately 1 minute on each side. Repeat with remaining cutouts. Just be sure to keep the oil hot so they don't get soggy. Lift donuts out carefully with a spider strainer so you don't damage them. Place on a rack to drain. 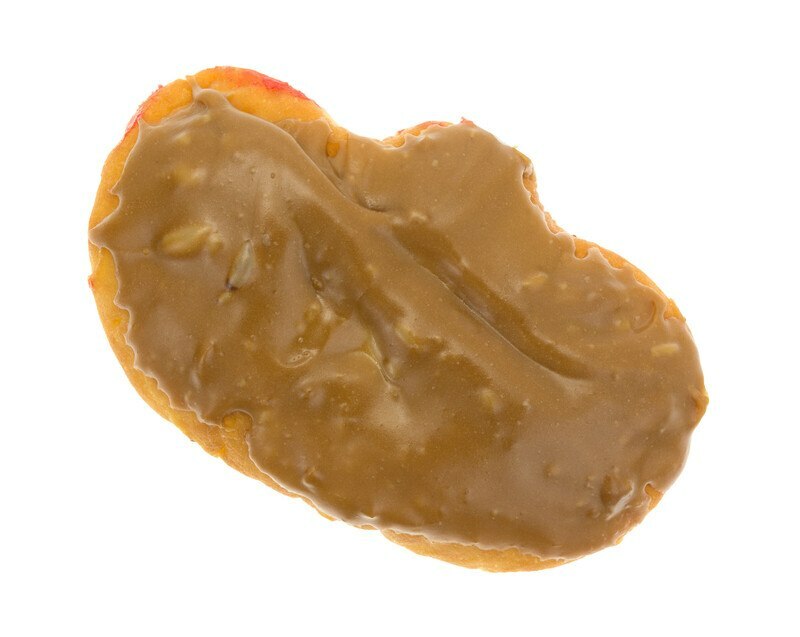 Option One: When cool, carefully create a pocket inside the donut to hold the filling. The opening should be very small so the filling doesn't leak out. Option Two: the easy way to do it is to use a pastry bag with a tip to fill them. Frost with warm chocolate icing in the recipe above. Put 1/4 cup cold water in a small saucepan and sprinkle gelatin on top; set aside. In a mixing bowl, beat egg yolks and granulated sugar together until frothy and pale yellow in color. In another bowl, beat egg whites until stiff peaks form. Beat the whipping cream and 1 tablespoon confectioners sugar only until it holds soft peaks. If the cream is too stiff, the dessert will be too firm. Warm up gelatin water on low until it turns to liquid and whisk into the egg yolk/sugar mixture. If it is hot, cool a bit because it may cook the egg yolks. Fold in the whipped cream and then fold in the egg whites. Add the vanilla extract and whisk well. Cover the top of the custard with plastic wrap and up the bowl because you don't want it to form a skin while it is chilling in the refrigerator for 4 hours. After four hours fill a pastry bag and use to fill the donuts. In a saucepan, combine the granulated sugar, 1-1/2 cups of whole milk and vanilla extract. Cook over low heat, stirring continuously until the sugar is dissolved with a flat wooden spoon. Raise the heat the heat to medium and scald the milk mixture. Scalding is heating milk until bubbles form around the outside. It is not boiling the milk. Remove milk from heat. In a bowl, add the cornstarch and whisk in the remaining 1/2 cup whole milk until mixture is smooth. Add the egg yolks and whisk until well blended. Slowly add 1/4 cup of the warm scaled milk mixture, whisking the entire time. Slowly pour in half of the mixture while whisking and then add the remaining warm milk. You are tempuring the mixture so you don't cook the eggs. Pour mixture back into the sauce pan and bring to a low boil over medium heat; cooking for 1 minute. No hotter than medium, or you will burn it. Remove from the heat and add the 3 tablespoons of unsalted butter. Place a fine sieve over a bowl and add the mixture to the sieve. Push filling through with a spatula and put in a bowl. Press plastic wrap directly on top of the mixture so it doesn't form a skin on it while chilling for four hours. We want it creamy. In a medium saucepan, add cream, milk, butter, vanilla and corn syrup - heat on medium until butter is melted. Turn to low heat and add the chocolate; whisking continuously until mixture is smooth. Remove from the heat and whisk in the confectioners sugar until smooth. Set aside. 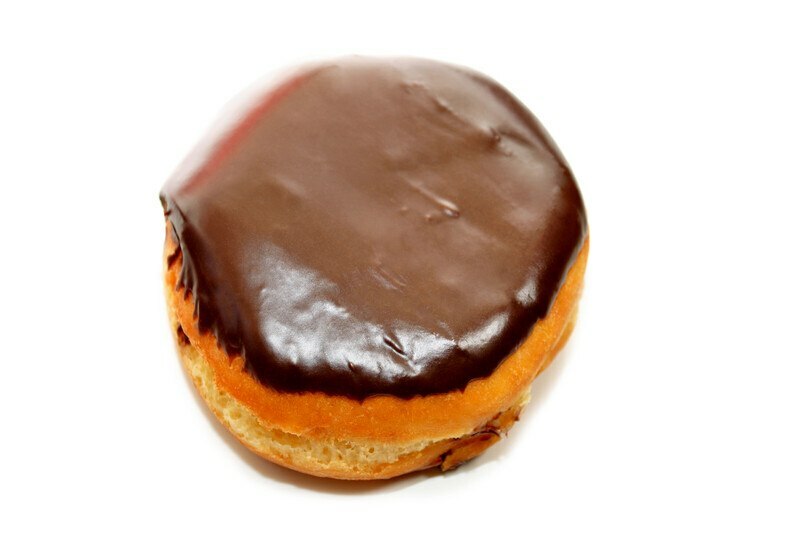 Dip the top of the donut in the warm chocolate icing. Place on a cooling rack for a few minutes and then it's ready to devour. Use the easy recipe above or the doughnut pastry from scratch. Use the easy recipe or the homemade recipe above. In a mixing bowl, cream the shortening and butter until fluffy and smooth. Gradually add the confectioners sugar - 1/2 cup at a time - mixing continuously. Add the vanilla extract and milk beating until light and fluffy. If it isn't, did you sift the powdered sugar? You can make this filling ahead of time as it keeps for two week in an airtight container in the refrigerator. Fill a pastry bag and fill those donuts. Frost with warm Chocolate Donut frosting (recipe above). *If you usually use salted butter for cooking/eating, the next time grocery shopping add a pound of unsalted to your cart and place in the freezer for these instances when salted butter won't do. Heat at least two cups of oil in a cast iron pan or heavy skillet and heat oil on medium low until it reaches 350 degrees. Meanwhile, separate biscuits and form each into an oblong shape like the donuts. Once the oil is ready, carefully lower two biscuits into the oil and fry until golden brown; approximately two minutes. Carefully turn over and fry another two minutes. Carefully remove with a spider strainer or slotted spoon and place on paper towels or a rack to drain. Repeat. Cool a bit and then whisk the icing and dip and immediately turn glaze-side up on a cooling rack. In a small saucepan, combine the butter and brown sugar on medium heat. Whisk in the milk and cook, stirring often for five minutes until sugar is dissolved and butter is melted. Remove from heat and add light corn syrup and maple extract. Whisk in confectioners sugar 1/2 cup at a time, stirring continuously. If the icing is too thick, add another teaspoon or two of milk. Place on the stove on low heat, whisking occasionally until ready to frost as it hardens at room temperature, which is exactly what you want. Nothing like having donuts in twenty minutes. Gotta love it. PREHEAT oven to 400 degrees and line a baking sheet with parchments paper. Lightly grease the paper; set aside. In a saucepan over medium heat, add the butter, sugar, water and vanilla extract. Simmer and add the flour, stirring with a wooden spoon until mixture comes off the sides of the pan easily. Put mixture into a mixing bowl and on medium low, add the eggs - one at a time, mixing well after each addition. 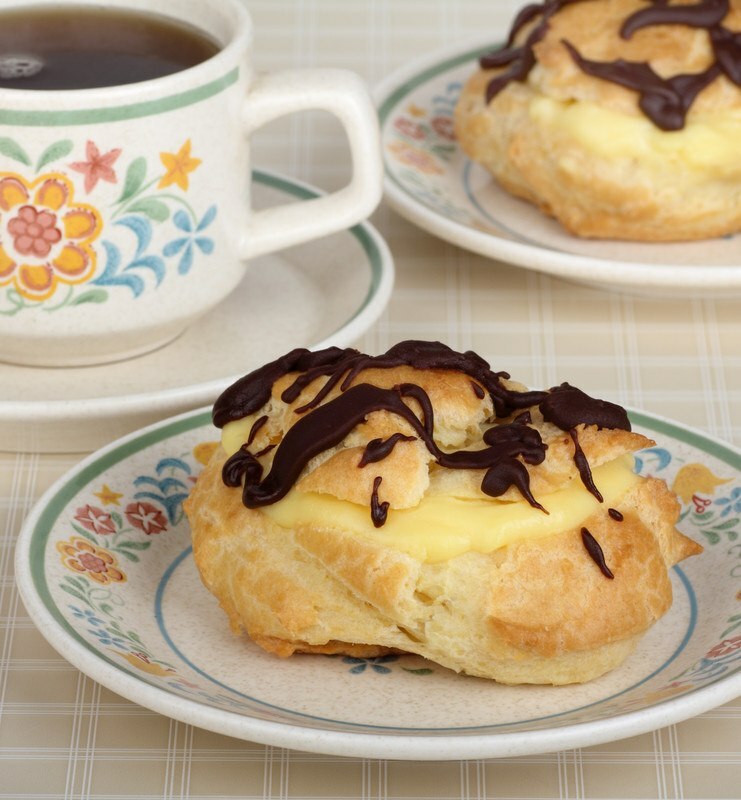 Fill a piping bag with dough and pipe thick lines of pastry that are 1-1/2 inches wide x 3 inches in length x 1 inch thick onto the prepared baking sheet. Bake for 25-28 minutes or until golden brown. Cool until you can handle them and fill.